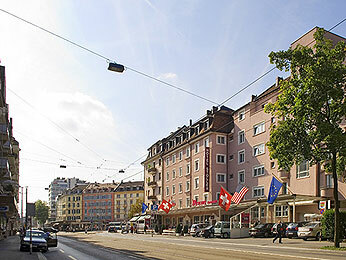 The Mercure Hotel Stoller Zurich is a 4-star franchise hotel with 80 stylish rooms and is non-smoking throughout. It offers a restaurant, a bar, a terrace and free Wi-Fi is available in all areas of the hotel. All rooms feature air conditioners, a minibar and an espresso/tea machine. The hotel is west of Zurich and easy to reach by public transport. It is just a few minutes from the main train station and just 25 minutes from Zurich airport. The “Zurich Stilsaal” is a conference room for up to 45 people and is suitable for a range of meetings, banquets and seminars. The traditional rustic Swiss room is very popular for partaking in a glass of wine and dining.